‘Coffee set’, Anonymous, early 20th century. Oil on canvas. Coffee and tobacco were among the most important pleasures in the Ottoman culture of living. 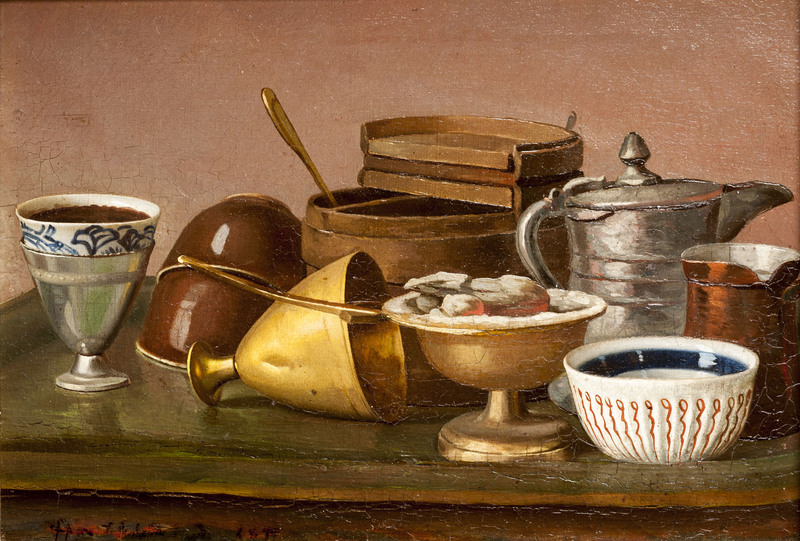 As of the mid-16th century, coffee and tobacco were offered almost everywhere from coffee houses to mansions and palaces as an indispensible means of accommodating guests or participating in causeries. Coffee was offered in cups without handles, known as “kallavi” set in cup holders called “zarf,” literally meaning envelope. Cups were either manufactured of Ottoman ceramic materials or a kind of unglazed earthenware called terra sigillata produced in the Tophane-Galata area in the 19th century and known as “Tophane işi.” The ceramic cups of Kütahya origin included in the Ekrem Hakkı Ayverdi Collection are also coupled with cup holders of the same kind. The porcelain kallavi cups produced in Europe for the Ottoman market as of the mid-19th century, on the other hand, were placed in silver or tombac (an alloy of copper and zinc) cup holders made in İstanbul. 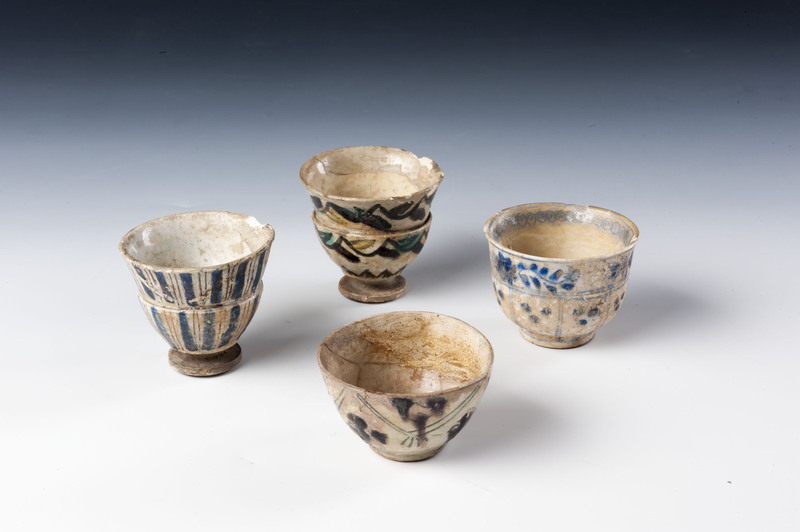 Coffee cups, Kütahya, mid 18th century. Ceramic. Cigarette holders. Amber, silver, cherry tree, early 20th century. The cigarette smoking became popular quite late in the Ottoman empire. 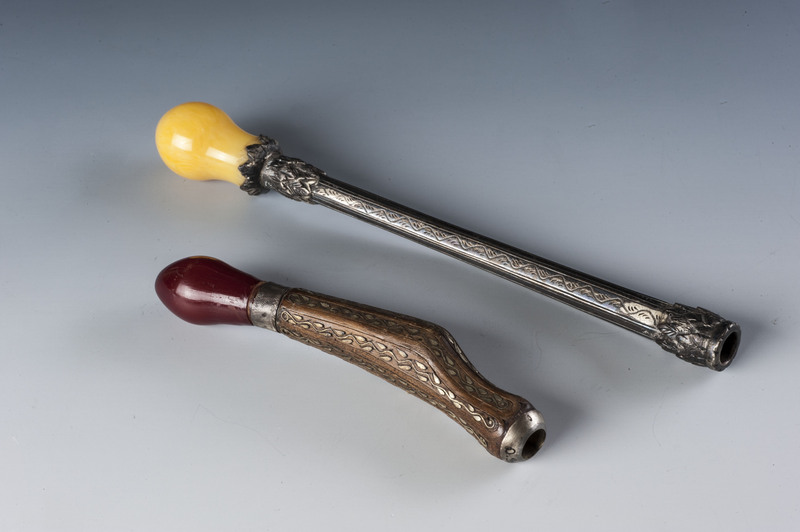 Until the second half of the 19th century, tobacco was smoked either in long and slender pipes or in nargilahs. The most common bowls attached to the tip of the pipes are the ones produced in Tophane. All are marked with the name of the masters that designed them. The water containers of the nargilahs used in palaces and mansions are made of cut crystal, whereas their tubes are amber, silver or gold. Most often, the marpuç (nargilah tube) was encrusted with precious and semi-precious stones.